When I give talks about issues that arise in the context of a global market for digital work, one of the most important things that comes up is the oversupply of labour power. I often get asked to share the table above, and so figured it would be useful to post here. 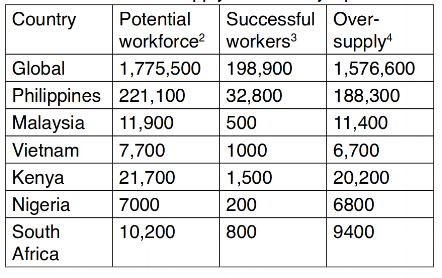 The table illustrates labour oversupply on one of the world's largest platforms. In the chart you can see that there are a huge number of people who come to these platforms looking for work, but never end up finding any. Something that our current fieldwork in the Geonet project strongly corroborates. This huge oversupply diminishes the ability of workers to secure better wages or working conditions. Graham, M., Lehdonvirta, V., Wood, A., Barnard, H., Hjorth, I., and Simon, D. P. 2017. The Risks and Rewards of Online Gig Work At the Global Margins. Oxford: Oxford Internet Institute.